Objectives Anxiety and/or depression during pregnancy or year after childbirth is the most common complication of childbearing. Economic evaluations of interventions for the prevention or treatment of perinatal anxiety and/or depression (PAD) were systematically reviewed with the aim of guiding researchers and commissioners of perinatal mental health services towards potentially cost-effective strategies. Methods Electronic searches were conducted on the MEDLINE, PsycINFO and NHS Economic Evaluation and Health Technology Assessment databases in September 2017 to identify relevant economic evaluations published since January 2000. Two stages of screening were used with prespecified inclusion/exclusion criteria. A data extraction form was designed prior to the literature search to capture key data. A published checklist was used to assess the quality of publications identified. Results Of the 168 non-duplicate citations identified, 8 studies met the inclusion criteria for the review; all but one focussing solely on postnatal depression in mothers. Interventions included prevention (3/8), treatment (3/8) or identification plus treatment (2/8). Two interventions were likely to be cost-effective, both incorporated identification plus treatment. Where the cost per quality-adjusted life year (QALY) gained was reported, interventions ranged from being dominant (cheaper and more effective than usual care) to costing £39 875/QALY. Conclusions Uncertainty and heterogeneity across studies in terms of setting and design make it difficult to make direct comparisons or draw strong conclusions. However, the two interventions incorporating identification plus treatment of perinatal depression were both likely to be cost-effective. Many gaps were identified in the economic evidence, such as the cost-effectiveness of interventions for perinatal anxiety, antenatal depression or interventions for fathers. A prespecified protocol was registered on the International Prospective Register of Systematic Reviews. The current evidence base was summarised and critically appraised using two approaches to minimise subjectivity. The review was limited to English language studies, which may introduce bias and it is possible that some studies were not identified despite the comprehensive search strategy. PAD can have important implications for the life-course of mothers and children13; depression during pregnancy is strongly associated with both depression and anxiety following childbirth.14 15 Other important potential long-term considerations include developmental delays and behavioural problems for children and family instability.4 16 The lifetime societal burden of PAD and other perinatal mental health conditions is massive, estimated at £8.1 billion for all the babies born in a single year in the UK (almost 700 000 in 2016).13 17 This includes costs related to time off work, marriage breakdown and social support. Evidence suggests that the costs of improving perinatal mental health outcomes are likely to be outweighed by the benefits7 18; high-quality economic evidence is needed to identify the most efficient ways of doing so. Different perinatal mental health conditions often co-occur14 23 and in the UK there has been a move towards commissioning the healthcare services for conditions under this umbrella together. Furthermore, widely used screening instruments such as the EPDS10 were not designed to differentiate between different perinatal mental health conditions, which may mean that people with different (although related) conditions are treated with the same interventions. As such it is likely to be more relevant and useful to commissioners and researchers to present synthesised evidence from a broad range of interventions for PAD. There has not been a recent review which aimed to bring all of the economic evidence on preventative and treatment interventions for PAD into a single narrative. This review sought to produce an up-to-date synthesis of current knowledge about the cost-effectiveness of interventions for the prevention or treatment of PAD. Particular objectives were to identify characteristics of potentially cost-effective interventions, gaps in current knowledge and important avenues for future research. In the UK, there has been a pledge to increase healthcare spending to improve maternal mental health and therefore decision makers need to know which interventions are likely to be cost-effective so that these vital funds are allocated efficiently.22 The aim of this review is to provide an evidence base that could potentially inform these decisions by bringing information from different sources together into a comprehensive and critically appraised summary with recommendations for commissioners and researchers. What are the characteristics of existing interventions for PAD that are likely to be cost-effective? Where do the evidence and knowledge gaps indicate future research should be focused? The review protocol was registered on the International Prospective Register of Systematic Reviews register of systematic reviews (CRD42016051133). Explicit inclusion criteria were: (a) studies focusing on mothers and/or fathers experiencing or at risk of developing perinatal depression and/or anxiety, (b) any psychological, psychosocial and/or pharmacological intervention, (c) alternative interventions and usual care or placebo as comparators, (d) incremental assessment of cost-effectiveness. Previous systematic reviews were excluded but screened for additional references. Electronic searches were performed on the PsycINFO, MEDLINE, NHS economic evaluation database (EED) and NHS Health Technology Assessment database. An initial search was run in September 2016 which was updated in September 2017. The searches were restricted to English language publications from January 2000 onwards; changes in practice and resource use/costs over time mean that older references are less useful for decision making. Common search terms included words related to perinatal depression and/or anxiety and economic evaluation terms. Terms varied slightly according to database designs. The search strategies are reported in online supplementary table S1. The bibliographies of previously published systematic reviews18 22 were hand-screened for additional references to ensure all relevant papers were captured. Abstracts of studies were examined independently by two reviewers (EMC and GES) to determine whether each publication met the inclusion criteria. Both reviewers independently considered the full-text of identified publications to ensure that inclusion criteria were met. At each stage, any discrepancies were resolved through discussion and a consensus reached on which publications should progress to the data extraction stage. Structured data extraction and quality assessment was undertaken, guided by the NHS EED handbook.24 A dual-purpose (data extraction and quality assessment) form was designed a priori (see online supplementary table S2) and used to extract information on study methodology, results, limitations, evidence gaps and quality. The quality of the studies was also assessed using a modified version of the Consensus Health Economic Criteria (CHEC)-list.25 The checklist and assessment results are included in online supplementary table S3. One reviewer (EMC) completed the data extraction process with half reviewed by the second reviewer (GES). No issues were identified which suggested that the second reviewer needed to review all data extracted. Costs were converted to Great British Pounds (£) at the average exchange rate for the cost year reported in the source study.26 All costs were inflated to 2015/2016 based on the Hospital and Community Health Services index.27 Exchange and inflation rates are reported in online supplementary table S4. Neither patients nor the public were involved in this research. Initial searches identified 257 citations; following the removal of duplicates, the titles and abstracts of the remaining 168 citations were screened for eligibility (figure 1). Twenty-eight papers were included for full-text review, with eight papers were identified as relevant to the review (see online supplementary table S5 for details of excluded studies). The two systematic reviews that were hand-searched resulted in no additional references.18 22 Key characteristics of the eight included studies are described in table 1. Preferred Reporting Items for Systematic Reviews and Meta-Analyses flow diagram of studies identified. The interventions evaluated across the eight studies were diverse and no two studies evaluated comparable interventions. Three studies included a preventative intervention,29 34 35 three focused on treatment28 31 32 and two included complex interventions incorporating both identification and treatment.30 33 All studies focused on postnatal depression in mothers, although the study by Ride et al did also consider anxiety in mothers and the mental health of fathers in the perinatal period.34 Two of the preventative interventions were targeted at distinct groups: high risk women29; first time mothers.34 One intervention involved lay or peer support,35 two were delivered by health visitors29 30 and the remainder were delivered across a range of settings/healthcare professionals/structures including collaborative care32 33 and group cognitive behavioural therapy (gCBT).31 The comparator intervention for all studies was described as usual or routine care. Usual care is likely to vary by setting which affects the external validity of the study. The majority (n=6) of studies reported cost-effectiveness analyses with different measures of health benefits, which makes it difficult to compare between studies.28 29 32–35 The most widely used (primary or secondary) measure of health benefit was the EPDS, which was reported in two of the six trial-based studies.30 35 Cost-utility analyses were reported in four studies, making results across these studies easier to compare30 31 33 34 (two of which had also reported cost-effectiveness33 34). Utility was derived from the Short Form-Six Dimension (SF-6D) in two studies30 31 and from the EuroQoL-Five Dimension (EQ-5D) in two studies.33 34 Only two studies reported the results of an economic models31 33 with the remainder reporting trial-based results. The model by Stevenson et al evaluating group CBT to treat postnatal depression in the UK was informed by expert opinion alongside published data available from randomised controlled trials for EPDS and SF-6D scores31 (table 2). The model structure was not explicitly reported. The model by Wilkinson et al evaluating collaboration between general practitioners (GPs) and psychiatrists to identify and treat postnatal depression included estimates for the EPDS and EQ-5D from published literature.33 Some of the model parameters were from studies of anxiety/depression outside of the perinatal period and the model structure, although pragmatic potentially oversimplified suicide risk (table 2). Both model-based evaluations reported probabilistic sensitivity analysis. Six studies reported incremental cost-effectiveness ratios (ICERs), half of which were in terms of clinical outcomes28 29 35 and half in terms of QALY gains associated with the intervention compared with usual care.31 33 34 Two interventions were either likely or highly likely to be cost-effective, both incorporating identification plus treatment of postnatal depression: health visitor screening and counselling30; GP/psychiatrist collaborative screening and treatment.33 The intervention involving health visitors was associated with lower costs and better outcomes than usual care, therefore the authors did not report an ICER because the intervention dominated usual care. However, when multiple imputation was used to resolve missing data (rather than a complete case analysis), the intervention was associated with more QALYs and a net cost resulting in an ICER of £15 666/QALY. Eight studies evaluating the cost-effectiveness of interventions for PAD were included in this review. All were published between 2006 and 2017. Six studies were high quality and two average quality. Each study focused on depression occurring in postnatal mothers (although Ride et al also considered anxiety and fathers34), but evaluated a different type of intervention, some of which focused on prevention and others focused on treatment (or identification plus treatment). Two studies identified interventions that were likely to be cost-effective, both of which incorporated identification plus treatment of postnatal depression. The quality of the studies included in the review was mixed and generally increased over time, which is likely to reflect the agreement of standards for the reporting of economic evaluations. The use of a standardised checklist, such as the commonly used Consolidated Health Economic Evaluation Reporting Standards checklist for the reporting of economic evaluations,36 would facilitate the synthesis of data in future reviews. In order to meaningfully compare studies, the most critical information required is: a full description of the intervention and comparator, inclusion/exclusion criteria, time horizon and perspective of the evaluation, the net outcome, the net cost, ICER and cost-effectiveness acceptability (reported as the likelihood an intervention is cost-effective at appropriate willingness to pay thresholds) and summary of uncertainty. There was great heterogeneity between the studies included in terms of the interventions, measure of benefit and time horizon. However, the interventions could be grouped by some characteristics such as their aim (eg, prevention or treatment) or key actors (eg, healthcare professional or peer support). There were inconsistent findings within the intervention subgroups with one exception. The two studies which incorporated identification plus treatment were both likely to be cost-effective.30 33 However, the two interventions were very different. The intervention evaluated by Morrell et al involved training health visitors to identify women experiencing postnatal depression and deliver talking therapy (using either a cognitive behavioural approach or a person-centred approach), whereas the intervention evaluated by Wilkinson et al was based around collaboration between GPs and psychiatrists. Due to a large amount of missing data, the health visitor intervention was only evaluated at 6 months, whereas the collaborative intervention was evaluated at 2 years. This also makes it difficult to compare results between studies because it is possible that over a longer follow-up more benefits are accrued. There are a number of strengths and limitations of this review. Multiple major literature databases relevant to health and economic research were searched, therefore it is likely that key studies incorporating the search terms have been identified. In the instance where a full text was not available online, the authors were contacted and provided a copy. The search was however restricted to English language studies, introducing some bias. 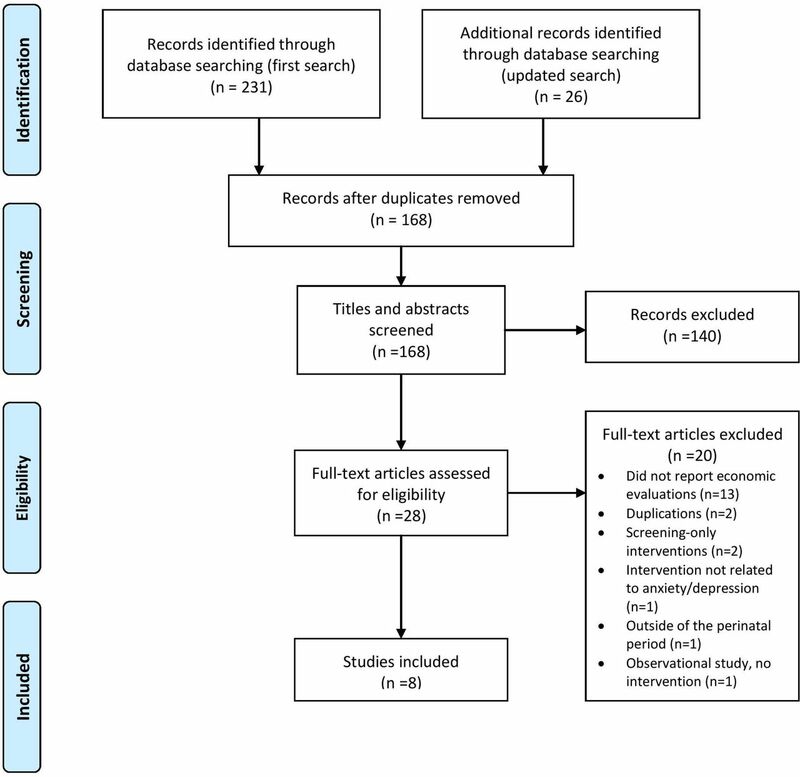 Searches were also restricted to published journal articles, which are less likely to include inconclusive or negative cost-effectiveness results when compared with the grey literature.41 The exclusion of studies published prior to the year 2000 may also have introduced bias; however, a post hoc search of the NHS EED database returned no relevant studies from before this time. Despite a robust search strategy, there may be relevant studies that were not identified by this review. For example, the definition of the perinatal period adopted by researchers (from conception up to 4 weeks,42 6 weeks43 or 12 months post partum7) will influence whether interventions for PAD are described as ’perinatal' or ’early childhood'. After this review was completed, a paper was brought to the authors' attention that involved an intervention for depression in mothers in the first year post partum. However, as it was described as an ’early childhood programme' and was not explicitly referred to as an intervention for postnatal or postpartum depression, it was not identified in this search.44 The intervention (in-home CBT) was nested within a complex home-visiting support programme, which aimed to improve the health and well-being of low-income parents and babies, which was the ’standard care' comparator in the economic evaluation. The study reported the results of an economic model that extrapolated the results from an RCT and concluded that in-home CBT was likely to be cost-effective compared with this standard care as a treatment for depression. Two separate tools were used to critically appraise the studies which included more criteria and gave a broader perspective than a single approach, although one was developed specifically for this review and not formally validated. The CHEC-list45 was used to assign a score to each study and the data extraction tool was used to identify potential sources of bias. Both approaches involve an element of subjectivity, the CHEC-list attempts to handle this by not classing a criteria as having been met if it is only partially met, however this may result in some loss of sensitivity. One study which was excluded from this review because it focused only on screening for postnatal depression concluded that it was not cost-effective to screen because of increased treatment costs.46 However, identification and treatment are inextricably linked and evaluating them separately may not tell the whole story, which should be borne in mind for future research. It is also necessary to address the lack of economic evidence for interventions for antenatal depression, perinatal anxiety and PAD in fathers as these conditions are also prevalent and may be associated with negative outcomes for individuals and families.47–49 Future economic evaluations should be conducted and reported according to good practice guidelines so that future reviews can make clear recommendations to inform health policy. Heterogeneity in the evaluations to date means that it is not possible to make any conclusions about their relative cost-effectiveness, with no clear implications for health policy. However, the two interventions that were likely to be cost-effective (compared with usual care) both incorporated identification and treatment together; this appears to be the most fruitful direction for future research and could inform perinatal mental health service strategy. As recognition of the incidence of perinatal anxiety in mothers, and all PAD conditions in fathers, grows so does the need for relevant and robust economic evidence, therefore this is also a recommended area for future research. The quality of the methods and reporting of economic evaluations for interventions related to PAD has improved over time, but it is important that new studies adhere to reporting guidelines that will facilitate future evidence synthesis. Department of Health, HM Government. No health without mental health: a cross-government mental health outcomes strategy for people of all ages. London: Stationery Office, 2011. World Health Organisation. Draft Mental Health Action Plan: An Overview. 2012 http://www.who.int/mental_health/mhgap/2_11_2012_Saxena.pdf. Committee AHDMP. Fourth National Mental Health Plan: an agenda for collaborative government action in mental health 2009-2014. Canberra, Australia: Department of Health and Ageing, 2009. Mental Health Taskforce to the NHS. The five year forward view for mental health. London: Mental Health Taskforce to the NHS, 2016. Department of Health. Prime Minister pledges a revolution in mental health treatment. 2016 https://www.gov.uk/government/news/prime-minister-pledges-a-revolution-in-mental-health-treatment. National Institute of Health and Care Excellence (NICE). Antenatal and postnatal mental health: clinical management and service guidance (CG 192). 2014 http://www.nice.org.uk/CG192.
. The structured clinical interview for DSM-III-R (SCID). I: history, rationale, and description. Arch Gen Psychiatry 1992;49:624–9.
. Detection of postnatal depression. development of the 10-item edinburgh postnatal depression scale. Br J Psychiatry 1987;150:782–6.
. Postpartum depression: Literature review of risk factors and interventions. Toronto Univ Heal Netw Women’s Heal Progr Toronto Public Heal 2003. Office for National Statistics. Births in England and Wales: 2016. London: Office for National Statistics, 2017.
. Best practice for perinatal mental health care: the economic case. London: Personal Social Services Research Unit (PSSRU), 2016. Centre for Reviews and Dissemination. NHS Economic Evaluation Database (NHS EED) Handbook. 2007 http://www.york.ac.uk/inst//%0Acrd/pdf/nhseed-handbook2007.pdf.
. Criteria list for assessment of methodological quality of economic evaluations: Consensus on Health Economic Criteria The authors thank the following persons for their participation in the Delphi panel. Int J Technol Assess Health Care 2005;21:240–5. OFX. Historical Currency Exchange Rates. 2017 https://www.ofx.com/en-gb/forex-news/historical-exchange-rates/yearly-average-rates/ (accessed 21 Sep2017).
. Unit costs of health and social care. 2015. National Institute of Health and Care Excellence (NICE). Guide to the methods of technology appraisal. London: National Institute for Clinical Excellence, 2013. The EuroQoL Group. EuroQol-a new facility for the measurement of health-related quality of life. Health Policy 1990;16:199–208. American Psychiatric Association. Diagnostic and statistical manual of mental disorders (DSM-5). Virginia: American Psychiatric Association, 2013. World Health Organization. The ICD-10 classification of mental and behavioural disorders. Int Classif 1992;10:1–267.
. Paternal postpartum depression. J Parent Fam Ment Hea 2016;1:1.
. Maternal perinatal anxiety: a review of prevalence and correlates. Clin Psychol 2015;1:16. Contributors EMC and GES conducted the literature search and data extraction. EMC wrote the first draft of the manuscript with contribution from GES to the final version. Data sharing statement Search strategies and data extraction templates are available in the supplementary material. No other unpublished data from the study are available.